Wassailing is a very ancient custom, particularly popular and strongly celebrated in the South West of England. Besides being a good excuse to drink lots of scrumpy (that’s cider…….. i.e. fermented apple juice, for my foreign readers), eat al-fresco, have a little sing-song and the odd dance or two, it is a custom to firstly ensure that any evil spirits are banished from orchards and secondly to encourage all the trees to grow well and basically, produce a bumper crop of apples in the following autumn. Of course, the scientist in me is saying that no amount of yodelling, dancing and pouring of cider over the ground (such a criminal waste!) is going to help trees in the slightest to produce a brilliant crop. A couple of years ago I attended another Wassail event where several of the local gentlemen farmers fired shotguns upwards into the apple trees, producing a veritable “rain” of bark, twigs and lichen on all those watching from below. How on earth does this “Wassailing-with-Attitude” – as I call it – help the poor apple trees produce more fruit, I ask! Surely, raking-in a good general fertiliser around the base of the tree would do far better. Nowhere near as dramatic, photogenic and entertaining, however! 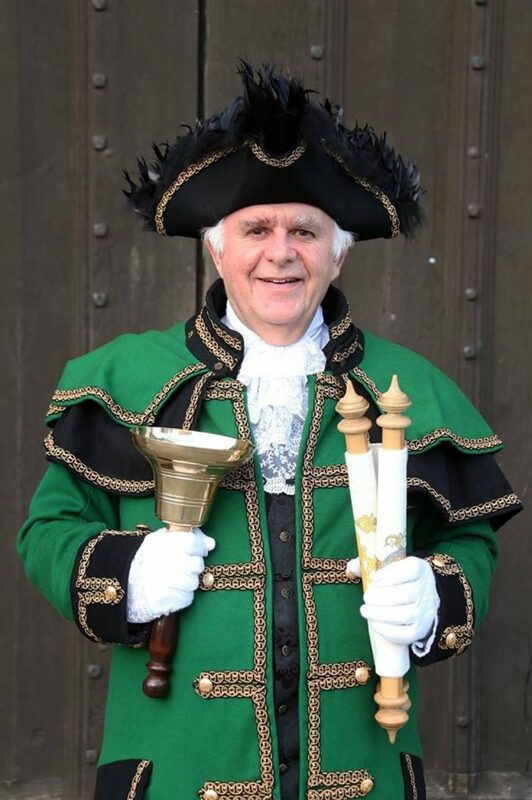 A year ago, I read an advert for a Wassail on the Tor and as Town Crier, I decided to robe-up and put in an appearance, just for the fun of it. After all, I couldn’t be accused of “gate-crashing” in my own town, now, could I? The organiser spotted me (not too difficult, I guess) and I was immediately asked to perform an impromptu introduction for her. Then a month or two ago, I received an e-mail asking me if I could actually be the “Master of Ceremonies” for this year’s Wassail event. I suppose I must have done something right! There was an offer of free food and free cider; how could I possibly refuse? I arrived early to park my car in a very muddy field, robe up and then collect my “free-cider and food” tickets! Luckily, I had my script sent to me, so I was good to go. When I arrived, the Morris Dancers were already entertaining the assembling crowd. I duly did my introduction and official welcome at the allotted time and things got underway. The first event was to get all two hundred assembled Wassailers to sing Wassail songs beneath each tree in the orchard. Such a nice touch, I thought……. giving each apple tree that bit of individual attention. I’m sure the apple trees appreciated it. There were a lot of trees in the Avalon Orchard, I might add! Whilst all this was going on, I was notified by the organiser that the BBC “Points West” News video crew had just arrived and wanted to film me doing a bit of my introduction that they missed. I obliged. I hope my bell ringing and subsequent shouting did not distract all the “singing to the trees” that was progressing in earnest! 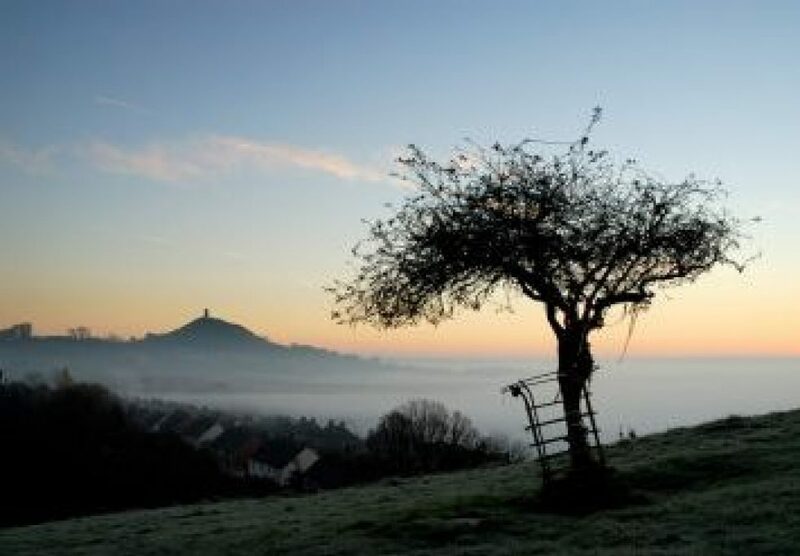 The assembled Merry Wassailers were also encouraged to tie small tags to the branches of the “Blessing Tree” with brief notes, explaining “how the Glastonbury Tor was important to them”. Later on, I announced for all gathered, to assemble round the Blessing Tree, where the main Wassail Ceremony would be performed by the Order of Bards, Ovates and Druids. Once the ceremony was over, further participation from the assembled crowds was requested. A big basket of toast was suddenly produced……yes dry, cold toast was thereupon offered to all. Not to eat, I hasten to add, but to place on the branches of the Blessing Tree! Apparently, this helps too! Watching the Wassailers adorning the Blessing Tree with slices of brown bread, I couldn’t help think that the bread was going to help the local bird population far more than the apple tree. But there again, birds eat insects and grubs that might possibly harm the trees, I thought to myself……… so perhaps it might help the trees indirectly. I’m such an over-thinker at times! The final and most captivating event, in my book, was the Story Teller. He was a most friendly, approachable and charming gentleman. I chatted to him for a while before introducing him. We all assembled around the fire – a more intimate gathering now, as quite a few had left, probably having had enough of the cold, damp January air. He told engaging stories of dragons, apples, eagles, glass mountains, knights in shining armour, princesses and castles. The children were enthralled – as was the Town Crier! Looking forward to my next Wassail. I find folk-lore and custom at once both wonderfully eccentric and absurd, and yet I relate to it on the most fundamental level. Perhaps it is the simplicity with which it expresses the most profound that draws my attention: it is untainted, natural, refreshingly pure and earthen reminding one that we are also ‘of the fields’. Thank you for posting and hosting a comments section for me to add my scrawl. Really Blog David and hope it will evolve, expand and gain an ever wider audience. There are some traditions in the UK that should never be let go of, and I’m not just talking about your unique and fascinating role as Crier. ; but more the idea of retaining a sense of attachment with the Land that defines us as human beings. One often gets the feeling that we live in a world that cares not for what and who we truly are but demands we become something un-natural, something other. The pomp and ceremony, the ‘fun’ the pageantry, the carnival, the cohesion of community, the sharing of common values and objectives: these are largely lost elements of society, and I think it a real shame that the modern world turns away from nature and the natural-laws that define us. Greetings from Glastonbury. I am very touched by your very kind words and eloquently expressed sentiments. I was also moved that you took the trouble to write such a lovely long reply to my little blog! Let me know when you’re visiting…….we must meet! The beer is on me, my friend! One of the pleasures I find in Blogging is pausing every now and again and appreciating the fullness of someone’s pressings. If felt comfortable to park-off here for a while and enjoy the dappled shade of Apple Trees and Orchards. Indeed I shall drop you a line before I head over the Severn and drop down to where you are. I imagine the meeting will fill and spill a bucket load of stories, smiles, laughter, and merry good cheer! Bottoms Up! Until then, I shall keep viewing your Blog and enjoying the many insights and perspectives you offer. I do drop Stephanie at S.C Richmond a line every now and again – https://scrichmondblog.wordpress.com/ – no doubt you’ll know her from Man Myth & Magik located in Market Place, Glastonbury. It was a re-blog she did that first brought me this way. Great stuff. Until we meet under the cider-press tap for a night of good cheer! Take care my friend.